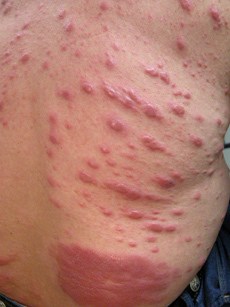 HISTORY: 46 y/o male with multiple red nodules and plaques on trunk and extremities of at least one year duration. See clinical pictures below. 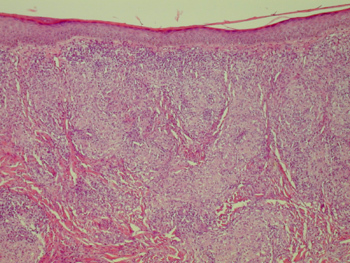 HISTOLOGIC FINDINGS: Sections showed multiple compact granulomas throughout the dermis, with a narrow grenz zone in the papillary dermis. 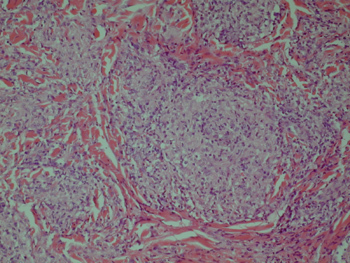 On higher magnification, the granulomas were made up by histiocytes with clear to eosinophilic cytoplasm, admixed with lesser numbers of lymphocytes. They were elongated in areas and surrounded ecrine glands in others. (See histologic pictures). A fite stain showed multiple bacilli in the histiocytes. COMMENT: The findings are those of multibacillary leprosy. 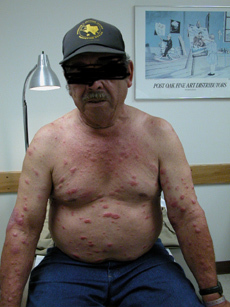 The clinical appearance, with multiple erythematous nodules, suggests histioid leprosy.